ENTERPRISE, Ore.—Wan Teece of Enterprise caught a kokanee weighing 8.23 pounds, measuring 26.25 inches in length with a girth of 16 inches at Wallowa Lake on March 24, breaking the Oregon state record for kokanee and possibly a national record, too. 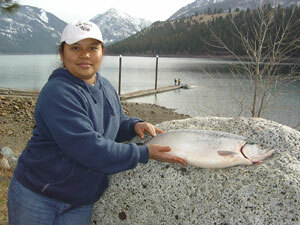 Wan Teece of Enterprise with her record kokanee caught March 24, 2010 at Wallowa Lake. The record kokanee was caught by Wan while she was out fishing with her husband Jack. They were trolling near the middle of the lake with a Jack Lloyd blade set-up dragging a Double-Whammy lure with two ounces of lead to keep it down deep. Just one month previously on Feb. 26, 2010, Gene Thiel caught a 7-pound 8-ounce, 25-inch kokanee at Wallowa Lake that broke the previous state record. The 73-year-old Joseph resident caught the fish while jigging from a canoe in 100 feet of water when conditions were icy. The previous kokanee record was set only in July 2009, for a 7-pound 1-ounce fish caught by former Joseph resident Jerry Logosz, also while trolling in Wallowa Lake. Wan Teece’s fish is the sixth time since 1999 that Wallowa Lake has broken the state record for kokanee. While many factors influence the large size of Wallowa Lake’s trophy kokanee, Knox says introduction of freshwater shrimp Mysis relicta into the lake in the mid-1960s is probably the main reason. The large kokanee are feeding on these shrimp, which were introduced in many Northwest lakes to produce trophy kokanee after the example of Kootenay Lake in British Columbia. Unfortunately, the introduction of shrimp had unintended consequences in some lakes, wiping out some kokanee populations. It is not clear how long trophy kokanee will continue to be caught in Wallowa Lake but Knox expects even more interest in this popular fishery in coming months. 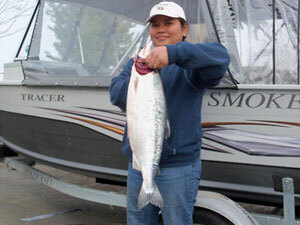 ODFW estimates that anglers spend 20,000-30,000 hours fishing for kokanee on Wallowa Lake annually.